Growing orchids means adjusting your plant care with the seasons and cymbidiums are a perfect example this. 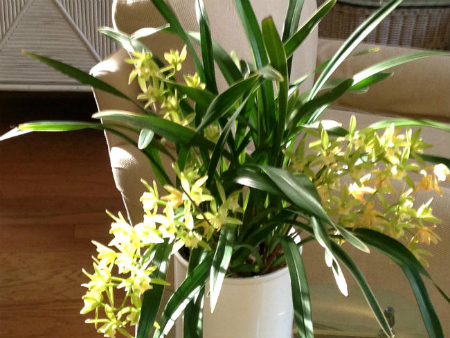 Cymbidium blooms in January - just when you need them! 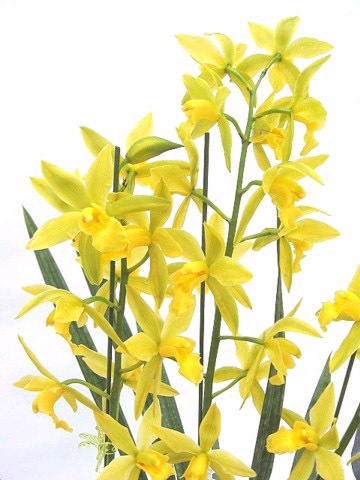 The key to Cymbidium Success is adjusting your plant care for an growing season outdoors in the summer and a blooming season indoors in the winter. The growing season begins when you move your plants outdoors in the spring. Check your local weather for the last frost date in your area. Cymbidiums need several hours of direct sun outdoors. These plants thrive in sun that would burn most orchids. Leaves are always a good indicator of proper light. They should be light green with a tinge of yellow - dark green means not enough light and your plants probably won't bloom. Too much sun and the leaves will turn yellow or bleached white. Cymbidiums don't like wet feet! In nature these plants grow in rocky soil that holds little moisture. The only nutrition they get is from bird droppings and other decaying material. So be stingy with water and nutrients. "When in doubt, do without" applies here. Water to only 1/4 on gauge (or about 1/2" in saucer) - no more! This should be easy because anything more should drain away. You can even water with the garden hose! Water in the reservoir at the bottom of the pot should never be more than 1/2" deep. If it is, your saucer is too deep and the roots will stay wet too long. Not good - cut saucer a little lower. Cymbidiums do not want to be standing in water all the time. 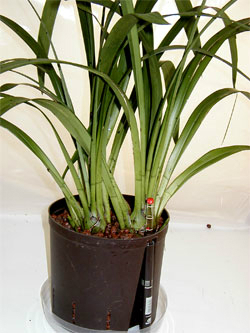 Allow enough time between waterings for the plants to sit completely dry for several days between waterings. 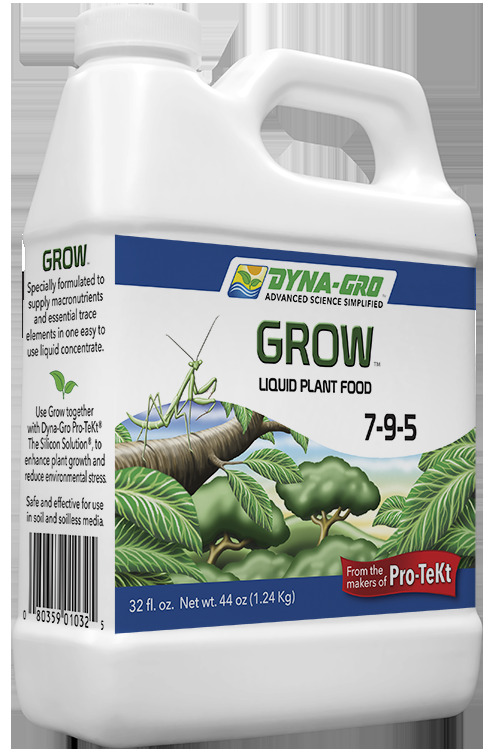 I use and recommend Dyna-Gro "Grow 7-9-5" formula 1/2 tsp per gallon every watering. I apply nutrients everytime I water because clear water from rain showers will flush the system and balance my nutrition program. 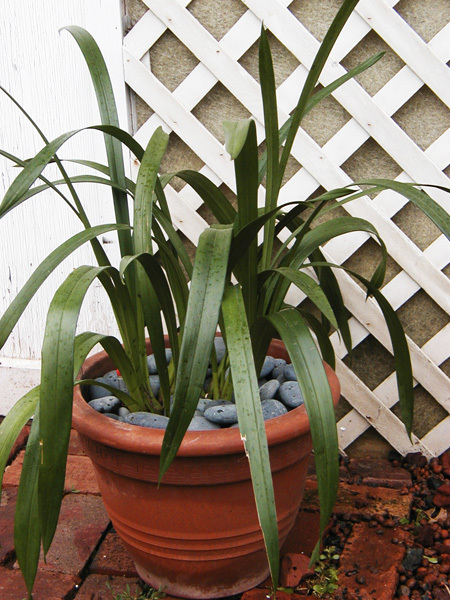 If your plants are protected from the rain, water thoroughly with plain water every couple of weeks. Cymbidiums require a wide range of temperatures (that's why they're not suited for indoor growing). They enjoy temperatures that reach into the 90's during the day. To initiate a bloom cycle however, temperatures must drop into the low to mid 40's at night. So keep your plants outside in the fall until the thermometer drops to the upper 30's(!). You might even see frost - don't worry - these plants can take it! Damage can occur if temps drop below 30 degrees however. After a couple of weeks with night time temperatures droppong into the high 30's - low 40's, it's time to move indoors. A sunny window is best. Try to keep plants as cool as possible, especially at night, preferably around 55 degrees. Too warm and new flower buds might drop off. In January things start to get exciting because you can start looking for flower spikes. After the first flowers begin to open, move your plant(s) away from the sun and display them wherever they look their best. They've stored up all the energy they need to complete their flowering cycle. Cooler temperatures (away fom the sun) will prolong the life of the blooms. New flower spikes emerging. This is what we've been waiting for! Moving your plants indoors slows their metabolism. Cut back on the water and stop using nutrients altogether. Pour water over pebbles slowly until water drains out the bottom - then stop. Repeat once a week. 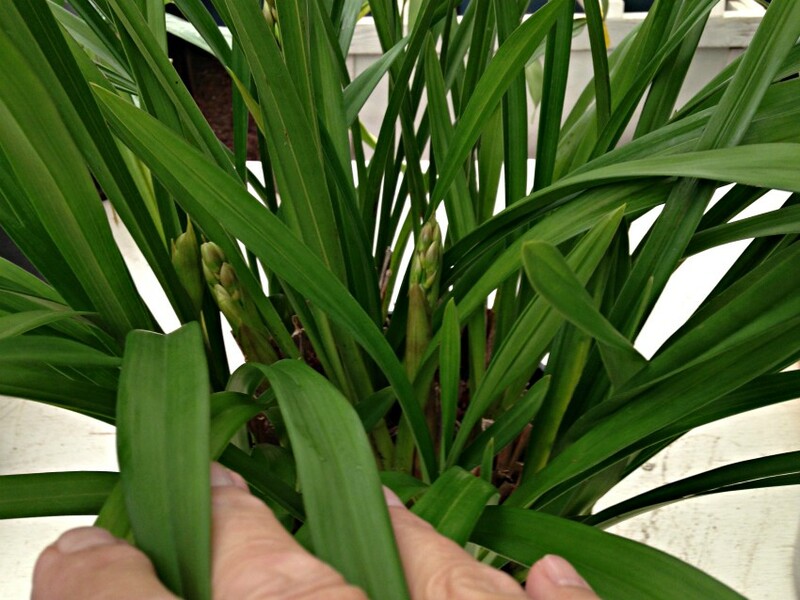 When flower spikes appear, start feeding again with a "bloom formula". 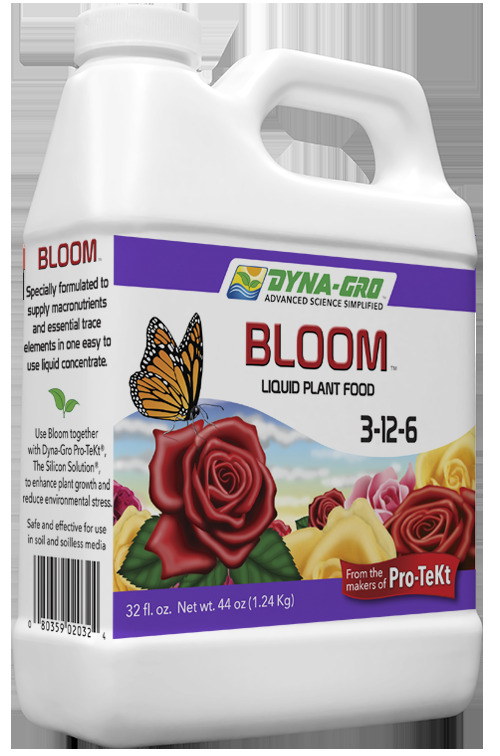 I use Dyna-Gro "Bloom 3-12-6" (1/2 tsp per gallon) to encourage bigger blooms that last longer. Grower Tip: "Bloom" nutrients won't make your plants bloom - only light and temperature can do that. Bloom nutrients simply encourage bigger, brighter blooms that last longer. You can also increase watering now. Water to 1/4 on gauge, then wait until plant is dry before rewatering. Continue this watering schedule throughout the bloom cycle. Try to keep your plants as cool as possible during this period. Closing off a heat vent at the window might be necessary. If that's not practical, install heat deflectors over the vents so the hot air from the furnace doesn't blow on the plant. If the leaves of the plant move when the furnace is on there's trouble. After the first couple of flowers open, move your plant(s) away from the window and display them wherever they look their best. They've stored up all the energy they need to complete their flowering cycle so they can be displayed wherever they look their best. Cooler temperatures (away from the sun) prolongs the life of the blooms. After the blooms have faded, cymbidiums go dormant, which corresponds to the dry season in their native habitat. Cut the flower stems back to the base of the plant and water only enough to keep the plant from dehydrating. Simply pour water (without nutrients) over the pebbles once a week or so. No standing water at the base. 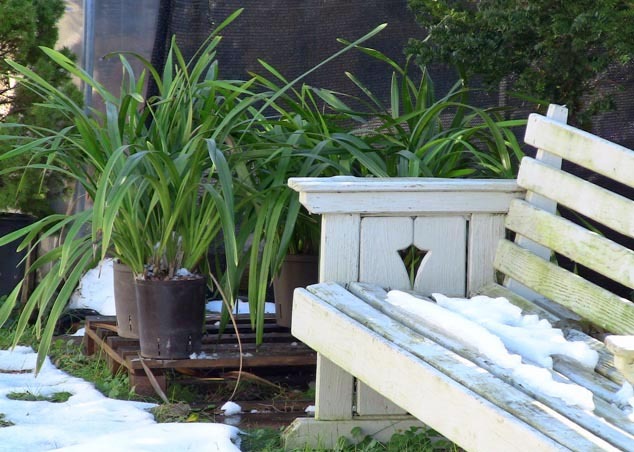 Don't expect new growth until the plants go back outdoors in the spring and a new growing season begins.